Here's the first of the 4 scr. shots required to capture mu Add/Remove Programs. I'm in Firefox again now, in Owner account, and the color chart works in FF here now. I'll try my limited account again later. Hope here comes scr, shot #2 of add/remove. And, like I said in my post before these screen shots, I wasn't sure of the order to do the defrag, these scr. shots, but, here they are, and I'll wait til I hear from you on the order of procedure.? This is color in Owner account Firefox. I would think the color should work in all accounts.? This is an EDIT on Sun. nite, 10/23/11. I'm in FireFoz browser. A) Let me try to rephrase. I didn't know if you wanted the screen shots before I was to do the Defrags you had mentioned. So, since I hadn't heard from you I decided to do the screen shots of Add/Remove first. I hope this is more clearly stated.? B) I just tried to use the color feature again, and it is not working in Firefox again tonight. C) Plus, I just finished installing IE8. I then opened IE up, and the home page was MSN, which I changed. But, the page was acting very unstable. Don't know if it was because of the new IE8 installation or just that it is Internet Explorer, which I still hate. IE has never worked well for me for some reason. I hope all this does not call for another System Restore back to earlier time. I don't understand what you mean by "unstable." What is happening when you use the IE8 browser? Does it do it all the time? Does the color in Firefox not work in your guest account only, or in your owner account too? 1. Click "Start" > "Run." Type "regedit" (minus the quotation marks) in the "Open" box and click "Ok." Your computer's Registry Editor will open. 2. Expand "HKEY_LOCAL_MACHINE" by clicking the +button to the left of it. Expand the "SOFTWARE," "Microsoft," "Windows" and "CurrentVersion" folders in the same manner. 3. Click on the "Run" folder. In the pane on the right, look for "wcmdmgr," "'wt gamechannel" and "ddcm." Delete them if they are present by right-clicking on the line they are on under the name column and selecting Delete. 4. Close the Registry Editor. Open "My Computer," double-click "Local Disk (C:)" and open the "Program Files" folder. 5. Find and delete the "WildTangent" folder by right clicking and choosing "Delete." 7. Run the Ccleaner "Registry" option to cleanup your registry. Delete Java 2 Runtime Environment SE v1.4.1_02 from Add/Remove Programs. Leave the other 2 Java Applications alone. After completing the above, and after installing all the software you are going to install, do the defrag of your C:\\ drive. I don't understand what you mean by "unstable." What is happening when you use the IE8 browser? Does it do it all the time? IE is slow to open, especially on pages such as MSN, which was the home page when I opened the browser for the first time. When using the auto scroller it moves the page herky jerky, instead of smoothly. I'm posting this now in IE, and the cursor is blinking constantly. These are some of the things I'm talking about. Plus, the screen shot in this post, the Welcome IE window appeared before I started this writing this. That's strange, since I installed IE8 on 10/23/11. So, that Welcome screen should not be coming up again.? I'll address the Firefox color in another post. Okay, I am now in Owner account and, like the other day Sat., 10/22/11 , the color works here, but, not in my Limited account. Friday, 10/21/11 the color worked in my Limited account. I think Saturday, 1022/11, was the first day the color did not work since the Wipe & Reload was done. Do you think something was infecting my files before the Wipe & R, and is causing all this instability now? See color. I just remembered, I tried posting the IE 8 Screen shot earlier in my Limited account, and along with the color, the "Host an Image" did not work there either. I'm glad you spotted the Java references in Add/Remove. I was going to ask you about them later. Also, won't it be Okay to go ahead and run my printer software set up CD, before doing the Wild Tangent Removal? Would those games be safer for wife to play than internet games? I don't know if you ever told me the reason for removing those games, so I'll ask again? I'm thinking that it would free quite a bit of space on the computer? IE is slow to open, especially on pages such as MSN, which was the home page when I opened the browser for the first time. When using the auto scroller it moves the page herky jerky, instead of smoothly. I'm posting this now in IE, and the cursor is blinking constantly. These are some of the things I'm talking about. Plus, the screen shot in this post, the Welcome IE window appeared before I started this writing this. That's strange, since I installed IE8 on 10/23/11. So, that Welcome screen should not be coming up again. My cursor blinks too. Seems normal to me. MSN is slow to load - that's normal. Google should load pretty fast. It all depends on your Processor and your download speed from your ISP. The auto scroller is jerky on mine too - I never use it. The welcome IE window will appear if you clicked "ask me later", or if you didn't complete the wizard the last time. No! If they did a destructive recovery, everything on your C drive was written over. I don't understand that, will have to do some research. Don't know when/if I'll find an answer. Could be some scripts are not allowed in the limited mode, but that wouldn't make sense if you could do it ok in your limited account once before. The post you made with the IE8 screenshot above did have color in it, sooo? Yes, I thought you had already done that, as well as downloaded and installed the anti-spyware applications. Would those games be safer for wife to play than internet games? I don't know if you ever told me the reason for removing those games, so I'll ask again? I'm thinking that it would free quite a bit of space on the computer? You can leave them on if you want to, but wildtangent is always talking to its website and it collects configuration information from your computer that is transmitted on a regular basis. Wildtanget will deliver content to the Web Driver software it put on your computer without your knowledge or permission. So you need to decide if you want to allow that or not. Since it is constantly keeping in touch with its website, it can slow the performance of your web browsing and the opening of applications on your computer. It has been considered spyware in the past. They say they don't collect personal info from your computer, but when they collect any information that they use for other than the normal cookie needed to maintain contact with your computer, that's too much in my book, and then, how do you know if you can trust them? If you run Spybot, it will probably find it and try to remove it. I'm not sure in the setup on hp just how much of wildtangent hp put there. All those games are part of it, but how much more is there, I don't know. I would remove them if the computer were mine, but I don't play games, and I don't want anything on my computer that is questionable. 2) I said: Do you think something was infecting my files before the Wipe & R, and is causing all this instability now? What I meant was, I thought that maybe something could have been in the "Saved Files", that remained on the computer. You would know more about that than me. It is just something that crossed my mind, & I don't even know if that could happen, you would know, that's all I meant. 3) Repa said: Yes, I thought you had already done that, as well as downloaded and installed the anti-spyware applications. I did, but, the 2 System Restore's that I had to do, caused me to have to do all the Apps, printer, etc., again. Then with these other questions that popped up, I decided to wait on the printer, in the event that I would need another Restore performed. Wild Tangent & Games: No I am going to remove them also. I feel the same as you about their privacy intrusions, etc. And, after posting that yesterday, I later thought that those games would take up space, plus probably slow the computer, as you mentioned. And, like you I don't play games either. Hey, Maybe she needs her a computer for games like your wife has! 1) I'm in Firefox again in my limited account, and along with the color, none of the other features in the line with it, does not work either, just FYI. Do you have the NoScript Add-on for Firefox? In order for those edit functions to work, illiweb.com has to be allowed. If it isn't, then they don't work because that is where they reside. I'm thinking that either you don't have that allowed in NoScript if you have it in your limited user account (note: you also need to allow forumotion.net), or else the limited user account or guest account security settings are blocking illiweb.com since it is a third party piggybacking on to forumotion.net. Do you experience this same problem with IE8 in the limited user account and not in your owner account as well? Well, you know, she'd probably love to have her own laptop where she can play wherever she wants in the house. Staples runs specials on laptops almost weekly, and you can get some pretty good deals there if you are patient and look for the sales and coupons, or look at a refurbished computer, where there is usually considerable savings. Register on www.staples.com for their newsletters, and you'll get offers weekly. But if you go this route, don't get an HP. Take a look at some of the Acer machines - they have made major improvements in their systems and are generally less expensive than their counterparts. I have one, an Acer Aspire 5253-BZ480 and well pleased with it. And, it runs super cool, has plenty of hard drive (320GB), AMD Dual-core E-350, and 4GB RAM. I just enabled illiweb.com to see if it would make the color work, and it erased my entire post. It made the color work, but, I'll have to begin all over again. Why did it erase my entire post? Before I lost my post, I was telling you about IE8, and the color edit function works in IE*. But, other strange stuff keeps happening in Internet Explorer, for some reason. When IE opens up it's in restore down(the whole page does not open up fully). Then, I got the Welcome to IE8 window again, just like the screen shot at the top of this page. Well, I can't remember everything that I had written before allowing illiweb.com in No Script, & it then disappeared. But, IE has never been my friend. That's why I originally got FireFox to begin with, as you might remember.? Anyway, I still do not like IE browser! And, this is just some of the stuffthat goes on when I am in IE. Oh yeah, I just remembered another thing that happens in IE8, but, it happened before in other versions of IE in the past also. I've been getting "The Program is Not Responding", and "If you End the Program Now You may Lose any Unsaved Data". Do you know why IE does all this stuff? Got color though, in FireFox! It resets the page, and any posts you were making are gone. When in Firefox, you need to check what is enabled in NoScript before starting posts. Is the "Program Not Responding" happening when you close ie8, or when you are shutting down your computer after closing ie8? Does it happen every time or just occasionally? I was just in IE in the Owner Account, to see if the IE Welcome window opened up again, it did. I'm pretty sure I completed the Wizard after the IE8 installation, but, I clicked "Next", and went through it again to the "Finish", hoping that will prevent it opening again. I forgot to look at your Leo link, but, when I saw your post I went to see what Leo had to say. I didn't get all the questions that Leo showed, and I answered some differently than he did. But, maybe that took care of the IE Welcome window. And, while I was already in IE in Owner account I thought I'd post this while I was already in IE. Here's another reason to make my case on why I don't like IE. I wrote the first paragraph, and clicked the Enter key to start a new paragraph. Well, guess what, lo and behold, my post disappeared! Wonder why that happened? Here's an item I was telling you last night when the post was lost. After you suggested that I add on No Script to Firefox, then I allowed forumotion.net, but not illiweb.com, because I was not aware of it. 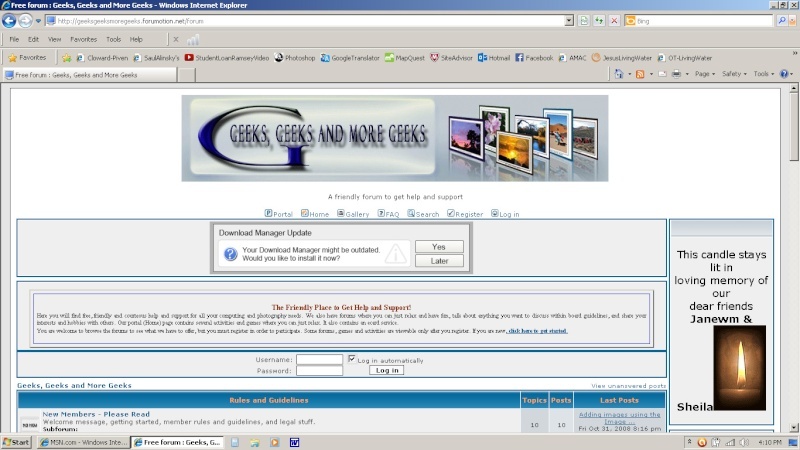 And, during that time without allowing illiweb.com, the edit color, and those functions worked without me allowing it. I wonder why? Here's a question about the edit functions. Why is it when I was clicking the color function to see if it worked, and then it did, but, why is there no way to make it go away if you don't want to actually use the color, or any of the functions for that matter? Back to IE8: IE never opens to a full page, you have to expand it. Back years ago, when IE was the only browser I knew about, I learned a trick that usually worked to make it open to the full page. You move your mouse to a corner of the page and drag it out to where you want it. Then do the same to the opposite corner until you have the page fully opened. Then go to the red X and close the browser. Then when you open it again, it should be in Full Page mode. Repa: Is the "Program Not Responding" happening when you close ie8, or when you are shutting down your computer after closing ie8? Does it happen every time or just occasionally? It occurs occasionally when closing, I don't ever remember it doing it when shutting down. And, I have also had that message appear in FireFox before occasionally. And, in both browsers, before the "Wipe & Reload". But, just in IE8 since the wipe&reload. I went back to do an edit in the above post, and the little scroll bar arrows never appeared, so I was unable to move the text. I also noticed where it ask "Reason for Edit". Is this all something new? 1) My computer is a desktop. When we have a thunderstorm, I have always turned the computer off, because I thought lightning might run in on the computer. Is this a silly notion, or is it okay to use the computer in electrical storms? 2) It should be okay to upgrade my Adobe Flash and Adobe Reader won't it? You'll have to complete the Welcome Window wizard for each account you use on your computer. Different users have different preferences - at least that's what the Wizard thinks! Haven't a clue why your post disappeared. Because NoScript means exactly what it says. It doesn't allow scripts to be executed from a site unless you allow it, and therefore a very desirable protection of your computer. Without NoScript, Firefox will allow scripts from any site within the parameters of the Security settings you choose. All you have to do is click on the color function again, and it will go away. Same with any of the other functions. If you open a browser and expand it by dragging the corners to where you want them, and then while holding down the left Shift and Ctrl keys simultaneously, on the menu bar select File > Exit, the next time you open the browser, it should open to where you last set it, and thereafter. There are some registry edits you can try that should fix that, but I'll have to get back to you on that in a later post. Also, one or more of the browser add-ons could be causing the problem. You can try disabling them all, run for a while in this configuration and see if the problem occurs when you close the browser. if it doesn't, then one or more of the add-ons is causing the problem, so you would then enable them one at a time to see if you can isolate which might be causing the problem. To disable/enable add-ons, on the menu bar selecdt Tools > Manage Add-ons. Then select each add-on and you will see a button to disable it. You turn them back on the same way. I do not use my desktop during a storm, even though it is on a UPS. I turn it off. No, it's always been there. After so many times of editing and sending a post, that will appear. Don't know why the scroll bar didn't appear - I can't reproduce the problem. You have the wierdest problems! You have the wierdest problems! Rolling Eyes Rolling Eyes Rolling Eyes Tell me about it! I just tried removing some of the games in Add/Remove. I clicked the first one, then another, and each time Avast said to open them in "The Sandbox", which I did. It then asked if I wanted to Remove, I said yes. Finally it said it was uninstalled, but, after it says this, the game still remain in the Add/Remove list. I'm not clear on what to do now. Which of your recommendations do I follow? 1. Open Avast and select Additional Protection > Auto Sandbox > Settings. In the window that appears, uncheck Auto Sandbox, click Ok and close Avast. You do not want to go to the Auto Sandbox to do uninstalls. Avast is falsely detecting the uninstall wizard as potential malware. 2. Try removing the games now. If Avast tries to stop the operation, you should be given a choice to proceed or not proceed, or allow the program or not allow the program (I forget, so choose what lets you do the remove if you are confronted with that, and then check to see that it is gone). 3. If you aren't sure what to do at a given point in time, stop and ask here. If the games are not in Add/Remove Programs, then proceed as directed previously, but with the Auto Sandbox disabled. Let me know what happens. If you are unsuccessful, we may have to manually do this. The games are still in Add/Remove. I didn't set a restore point before trying to remove the first game, and the only restore point for yesterday is at 12:30 PM. Is there any problem with that Restore Point? That is about a 12 hour difference from that restore point and the time I tried to remove the first game, since I tried to remove it around midnight or a little before. Do I still need to restore that far back, or just do the Avast auto Sandbox thing? I don't know what happened to the uninstaller when you went into the sandbox - it could be gone or it's registry key gone, so restore to the 12:30pm restore point. That should put everything back the way it was. Then disable the sandbox and set a restore point (always set a restore point before changing anything on your computer so you know where to go back to if something goes wrong), and then try uninstalling the first game. If Avast interfers, you might want to unplug your modem from the wall outlet and then disable Avast until you get the uninstalls done. Or, to save yourself further agravation, you could just unplug your modem and disable Avast and thus avoid any problems with Avast. To disable Avast, right-click the icon in the system tray, select Avast Shields Control, select "Disable until computer is restarted." After uninstalling the first game, check to see that it is gone from Add/Remove programs before proceeding. If it is, then continue until they are all gone. Then, restart your computer and plug your modem back up. If anything doesn't look right after trying to remove the first game, post what you see happening before going any further. 1) Just finished Removal of those 15 HP/ Wild Tangent games, and while I was at it I removed Java 2 Runtime Environment SE v1.4.1_02 from Add/Remove Programs also. Was that Okay to remove Java while I was in there anyway? 2) Since I disabled Avast & unplugged the modem before uninstalling the games, I didn't mess with the Avast Sandbox. But, will I need to get Additional Protection in the Avast Auto Sandbox for future use or not? 3) For my future reference, why was it necessary to Restore back to before I first tried to remove the games? 4) Should I increase my System Restore space, and, if so I forgot how to get to where that's done? 5) I'm afraid the Wild Tangent folder is still in the C:\\Program Files though. On page 2 of this thread, there is 2 sets of instructions for deleting that folder. Do I follow the last set of instructions which is the last post on Page 2 , or the first set, or new instructions? And, I'll need to know, or find how to use the registry function of Ccleaner, I guess? 6) While I was logging out of my Owner Account, after the games removal, I got the pop up window, "The End Program" thing. It finally closed while I was trying to make a screen shot of it. But, it also said SGTray.exe, whatever that means. Other than being annoying, is that "End Program" anything to be concerned about? 7) I'll have to wait for your reply to continue. And, I'm too tired to do anymore tonight anyway. I hope it's Okay to finish tomorrow? Leave things as they are now since you didn't mess with the sandbox. Because that was the closest restore point you had to go back to. Not being there, I can't know if the registry keys for the uninstallers of the 2 programs you tried to uninstall were affected or not, and I didn't want to have to address the issue if things didn't work right for you. The restore insured that your configuration was the same as before you began the uninstalls. No, it's already at 10% of your hard drive, that's way more than enough. 7. Run the Ccleaner "Registry" option to cleanup your registry. Click Registry > Scan for Issues, and when completed, click "Fix selected issues." Click Yes to the question "Do you want to backup changes to the registry?" and click Save in the next window that appears. Then, click "Fix all selected issues" in the next window that appears, then click Close and you are done. The End Program thing is an annoyance only. You can probably fix it with some registry edits. SGTray.exe is supposed to be part of VERITAS Update Manager or VERITAS StorageGuard, but I don't see that in your Add/Remove Programs screen prints. Do you have an icon for SGTray.exe in your system tray? 1. Create a new Restore point. 3. Double-click WaitToKillAppTimeout in the right pane, and change the value data (measured in milliseconds) to 5000 and then click OK.
4. Double-click HungAppTimeout in the right pane of the same key, and change the value data to 2000 and then click OK.
5. Double-click AutoEndTasks in the right pane, and change the value data to 1 and then click OK.
8. double-click WaitToKillServiceTimeout in the right pane, change the value to 5000, and click OK. Note: Some systems don't have all the Registry key entries described above. To add a missing entry, right-click in the right pane of its key, choose New > String Value, type the name, such as AutoEndTasks, double-click the new entry, add its value data (1 in the case of AutoEndTasks), and click OK. I wanted to mention this to you before I begin your new instructions. On Tuesday, 10/25/11, while in my Owner Admin. account, a folder with a zipper on it appeared on the Desktop. I hovered the Mouse over it it says"New Compressed (Zipped) Folder, Date Modified: 10/25/11, Size: 22 Bytes. I opened it to see inside, and it showed a folder with a zipper, and above it said: Folder Tasks: Extract All Files. I called the shop that did my wipe & reload and he said that is nothing that he did, & If I don't know what it is, I might want to delete it, because it could be a virus. I wanted to mention it to you and get your opinion of what you think is the best way to handle it? Just use the Mouse to delete it, or what? I'll see if I can do a screen shot for you. I should have thought of that before posting this.